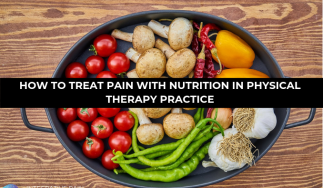 Helping patients to understand the many potential factors underlying their pain, including how the brain processes pain and nociception, can reduce maladaptive strategies and poor coping mechanisms. (2,3) Pain education is an expanding area of research and many practitioners are not up to date on the neuroscience and neurobiology required to treat persistent pain. Chronic pain is made worse by low-quality sleep, which places proper sleep hygiene at the top of the priority list. (4,5) Educating patients on the importance of quality sleep and how to achieve it (turning off electronics before bed; keeping the bedroom cool, comfortable, and dark; and using the bed only for intimacy and sleep) can help patients to achieve the rest they need. Defined as “training the mind to rest in the present moment”. (1) One way this can be useful is in reducing one’s fearful and catastrophic thinking. In this podcast, Dr. Beverly E. Thorn discusses the importance of using cognitive-behavioral therapy and mindfulness-based interventions in clinical practice. 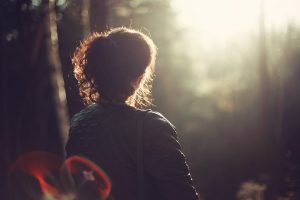 Mindfulness will likely become more prevalent in psychosocial pain care, as it not only has applications for pain coping, but also for practitioner burnout. 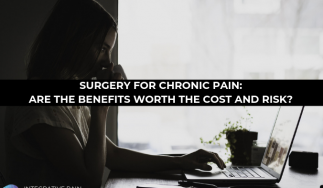 Patients with chronic pain can be prone to negative or fatalistic thinking, increasing stress and feeding into the cycle of fatigue and subsequent pain. Physiotherapists can help their patients to identify cognitive problems before devising a viable and positive solution. One often overlooked first step is to clarify the patient’s values. Acceptance and Commitment therapy provides a wonderful framework for “values work” that can get your patient’s feet moving in the right direction toward activities that are important to them. Pleasant activities motivate patients by encouraging them to maintain social connections and a positive attitude. PTs can (and should) emphasize the importance of making commitments to enjoyable activities and following through with them, even if that means setting a goal to do so in the future. Clients who pace themselves based on how they feel risk the potential of overdoing an activity. Time-based pacing, where the patient learns to stop an activity 10%-20% before their pain threshold, is the preferred approach in activity planning, as it helps patients to avoid this yo-yo cycle. 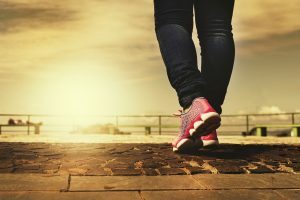 Clinical practice guidelines have shown that exercise is an essential component of any chronic pain management program. (6). A skilled PT can prescribe conditioning exercises specific to their clients’ pain concerns, recommending low impact exercises, such as yoga and tai chi, as appropriate. An exercise prescription can also be issued to promote movements or activities that increase fear and avoidance. Teaching patients how to use calming “self-statements” to redirect negative and fearful thinking can greatly reduce stress. One example might be reminding a patient that a current pain episode is the result of overdoing it the day before, and that they overdid it because they were feeling good. Cognitive restructuring can offer patients a fresh and more empowering perspective. As science continues to shed new light on our understanding of chronic pain, we welcome research advances that we can readily integrate in order to optimize patient care. In what ways do you incorporate cognitive-behavioral strategies or pain-coping skills into your practice? Leave a comment below or connect with us on FB. We would love to hear from you! 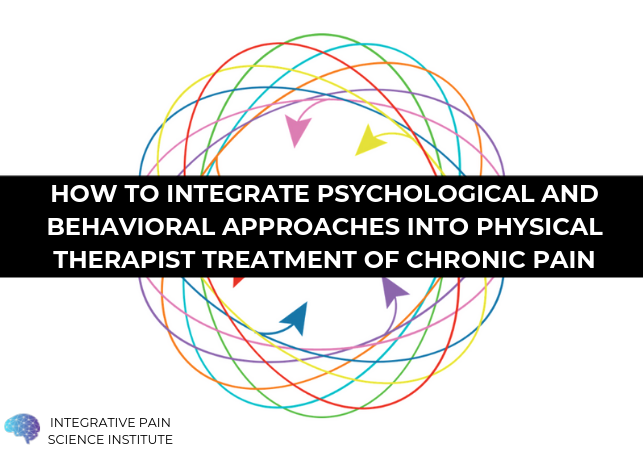 Russek L, McManus C. A practical guide to integrating behavioral and psychologically informed approaches into physical therapist management of patients with chronic pain. Orthopaedic Practice 2015;27:8-16. 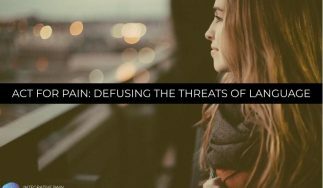 Louw A, Puentedura EL, Mintken P. Use of an abbreviated neuroscience education approach in the treatment of chronic low back pain: a case report. Physiother Theory Pract 2012;28(1):50-62. Meeus M, Nijis J, Van Oosterwijck, et al. Pain physiology education improves pain beliefs in patients with chronic fatigue syndrome compared with pacing and self-management education: a double-blind randomized controlled trial. Arch Phys Med Rehabil 2010;91(8):1153-9. Castro MM, Daltro C. Sleep patterns and symptoms of anxiety and depression in patients with chronic pain. Arq Neuropsiquiatr 2009;67:25-8. Davies KA, Macfarlane GJ, Nicholl BI, et al. Restorative sleep predicts the resolution of chronic widespread pain: results from the EPIFUND study. Rheumatology (Oxford) 2008;47:1809-13. California Department of Industrial Relations. Chronic Pain Medical Treatment Guidelines, in Medical Treatment Utilization Schedule (MTUS), 2009. Available: https://www.dir.ca.gov/dwc/DWCPropRegs/MTUS_Regulations/MTUS_ChronicPainMedicalTreatmentGuidelines.pdf. Accessed Oct 27, 2018.